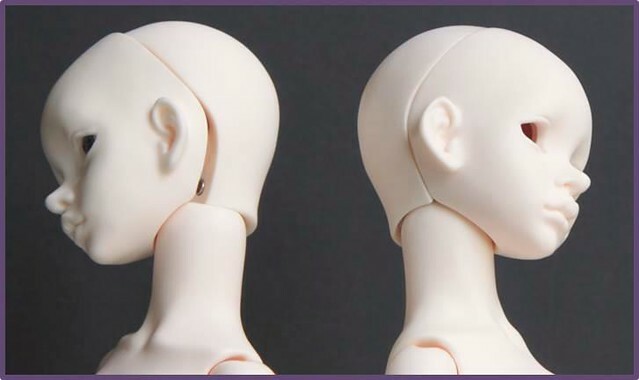 If you want to pair up a head and body made by different companies (a hybrid doll), you might need to do some modifications to make the two fit together nicely. 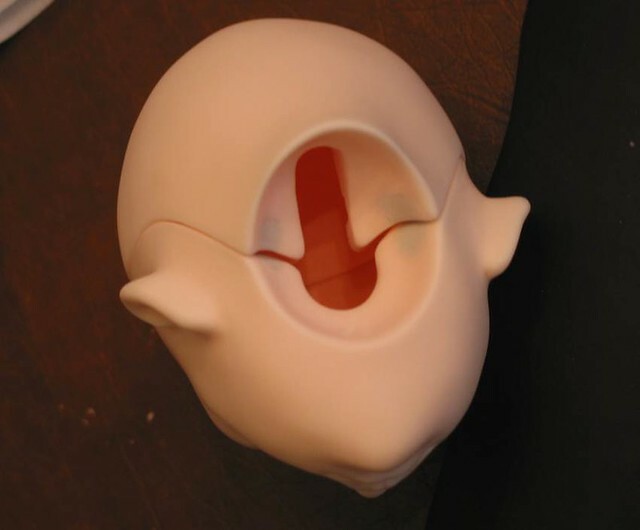 Generally, I avoid modifications (other than clean-up modifications like sanding seams) if I might ever sell the doll or if might decide to use the parts differently in the future. 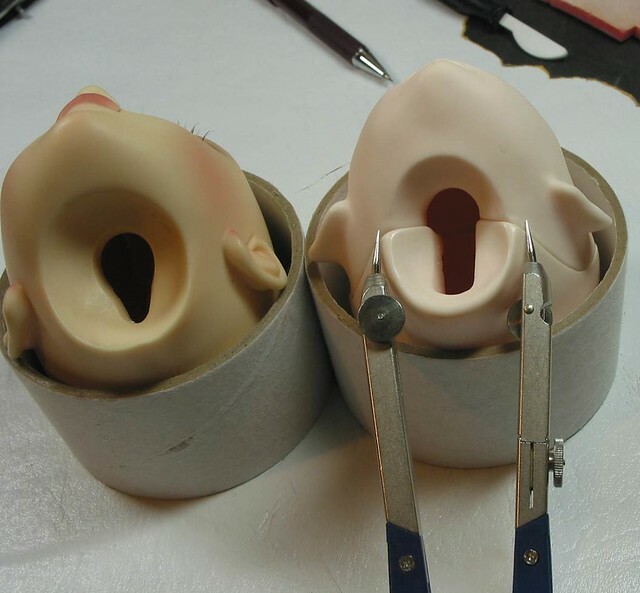 In this case, the head and body were manufactured to work together but the fit and function are poor. 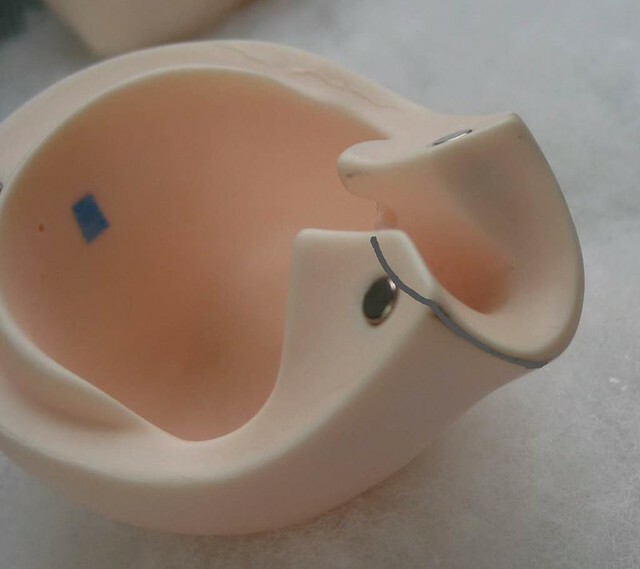 This doll is a Doll-In-Mind Lalia on the type 1 body. Before buying her, I had noticed in owner’s pictures that her head seemed to sit too high on the neck. I fell in love with her quirky face and decided I could fix that neck issue. Once I had her in hand, I noticed that it wasn’t just aesthetic, the bad fit would force the face plate off. So, a modification would definitely improve her. I will be modifying my doll, and if she turns out nice, I’ll also modify my friend Monica’s doll. She’s letting me practice on mine before having a go at hers. The photos below show Lalia before modification. 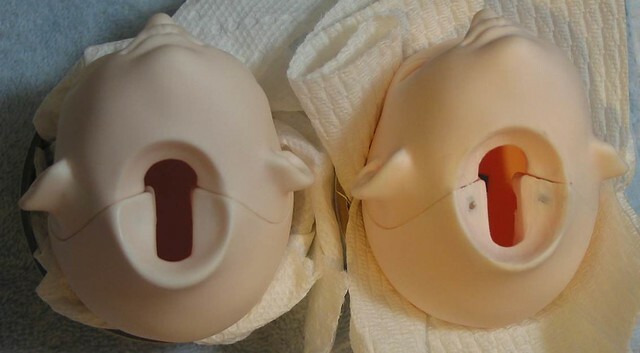 The photo on the left shows how the head perches high on the neck but the photo on the right shows the real problem—the head wants to jerk to the side which forces the faceplate off. Here are the tools I’ll be using. Do these projects outdoors and keep the dust out of your living area. The most important item is a dust mask. Resin dust will damage your lungs. Dremel or other hobby drill tool. This is a polishing attachment. 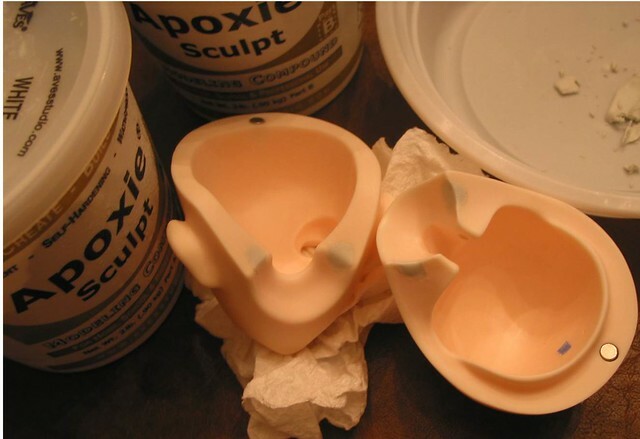 It is made of hard felt and works great for the final smoothing of the resin. If you need to remove a lot of resin, use a drilling attachment. I like the round shapes for working with resin. Avoid using these bits if you can because they can get away from you easily. This is a bullet shaped sanding bit. It can remove a lot of resin but is less likely to go too fast or get out of control. A compass or caliper is handy to measure the area you’re modifying. Extremely fine sand paper. This particular paper is made for the auto industry and it can be used wet or dry. Using it wet eliminates dust. Fine grit sanding sponge made by 3M. Work on an old towel that you can just throw away when you’re finished. I also like to use a piece of polyester quilt batting because it cushions and contains the dust and flakes. You can see it in other pictures. 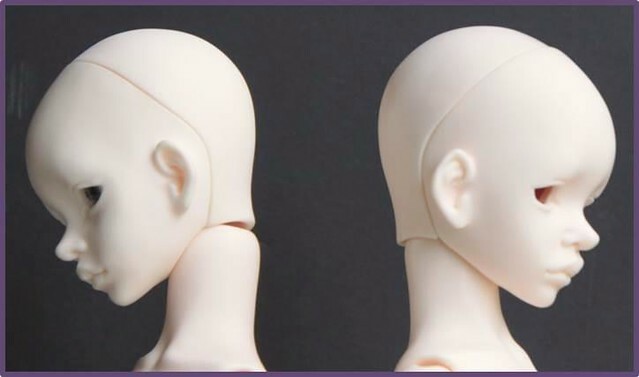 I found a head from another doll (Volks Emma in this case) that fit the DIM body better and I compared the size and depth of the neck opening to the DIM Lalia head. The Emma head has a much bigger and deeper opening. I’ll use this as a model for my modification and start carving. 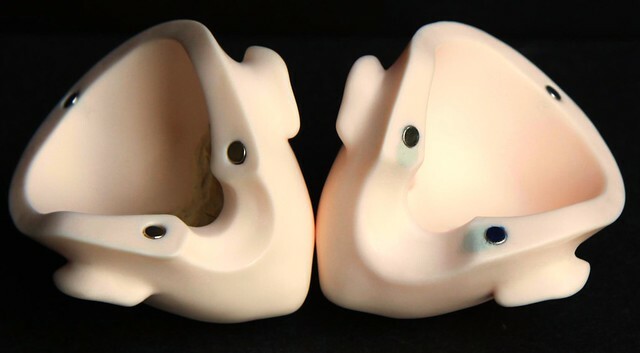 Usea soft pencil and draw guidelines for carving. I’m going to remove a lot of resin. 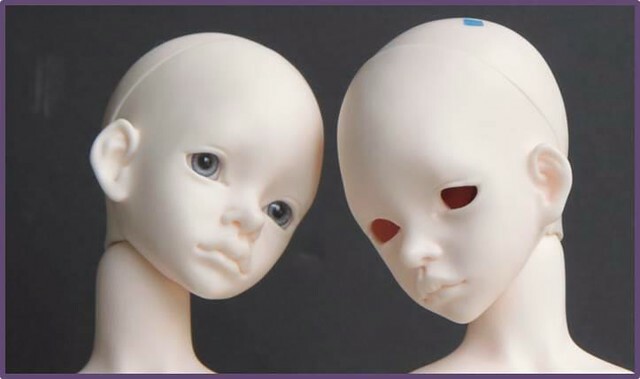 The next photo shows Monica’s unmodified head on the left, and my doll’s head on the right. I’ve carved away almost all the resin that needs to go. I mostly used the Cerra-Canna knife and just shaved away the resin. The Cerra-Canna knife also makes less airborne dust. I followed up with the Dremel tool using the bullet shaped sanding stone. I continued to try the head on the doll to see how the fit was improving. Patience! This photo shows how much resin has been removed from the head back so far. I need to carve even deeper into the head so I’ll have to remove the magnets. 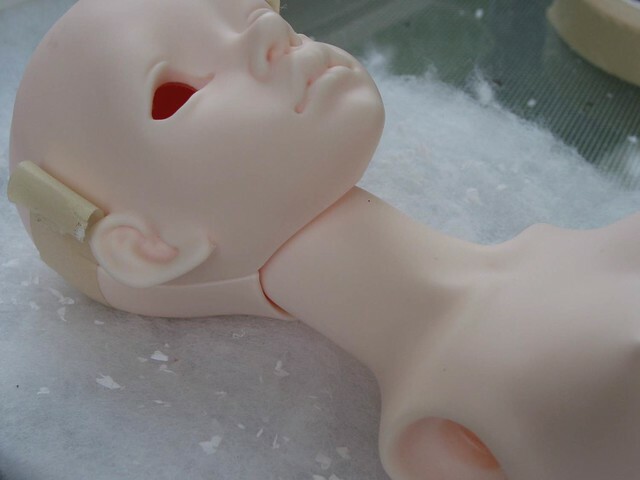 Most doll heads do not have magnets in this location so having to deal with magnets at the neck opening is unusual. I’ll have to take out the magnets and reposition them. I use acetone to soften the glue holding the magnets and pull them out with tweezers. 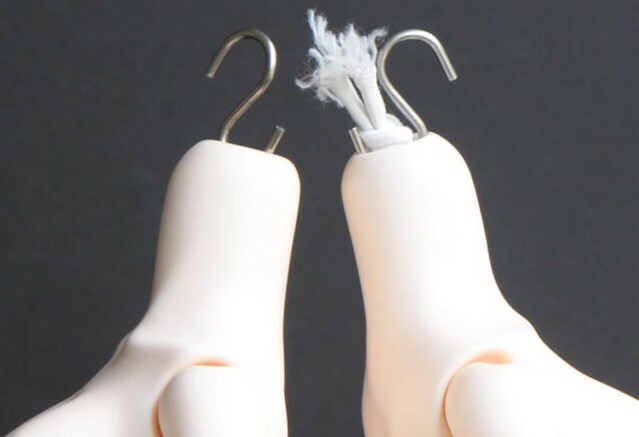 Dab the magnets with acetone on a cotton swab—be very careful with the acetone and follow safety precautions. It can be difficult to get the magnets out. The resin around the removed magnets is a bit messy but it is the inside of the head so that’s OK. I’ve removed some more resin and most of the carving is complete now. Check the fit often. 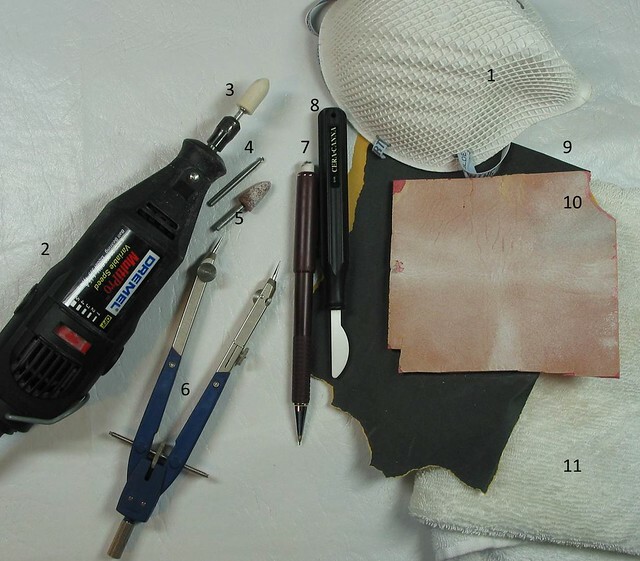 When the fit is nice, use the felt buffing attachment on the Dremel to make a smooth surface. Usually, I try to modify the head OR the neck, but not both. In this case, the head will pose better if I round off the top of the neck just a little. 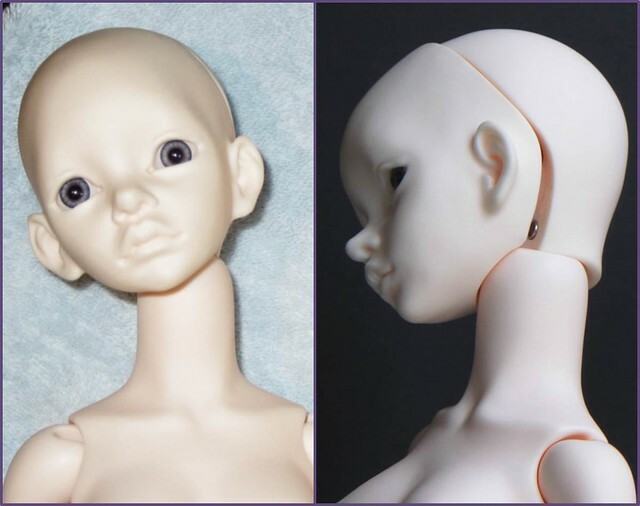 I compared the DIM neck to the other dolls in my collection and other dolls have a gentler, rounder curve at the top of the neck. The difference is hard to see. 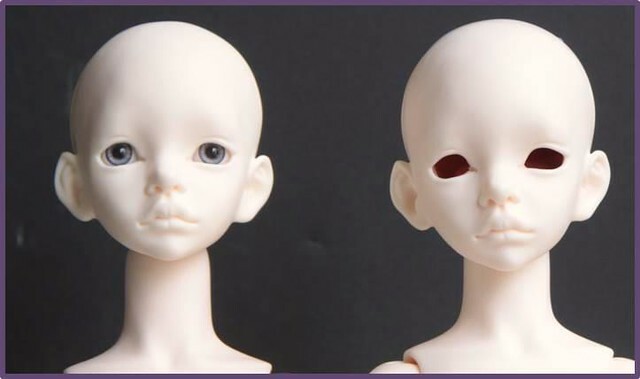 The unmodified DIM doll is on the left, and my modified doll is on the right. It is a small change. I filled the magnet holes with Apoxy Sculpt then sanded the area smooth after it dried. Use a drill bit in the Dremel tool to drill new holes for the magnets in the head-back and face-plate. Be sure to get them positioned so that they attract and not repel!!! I use a sharpie marker to color the sides that attract. When you have the magnets in one side, rub them with the soft pencil and put the head together to transfer the pencil marks to the other part of the head and get the magnets aligned properly. 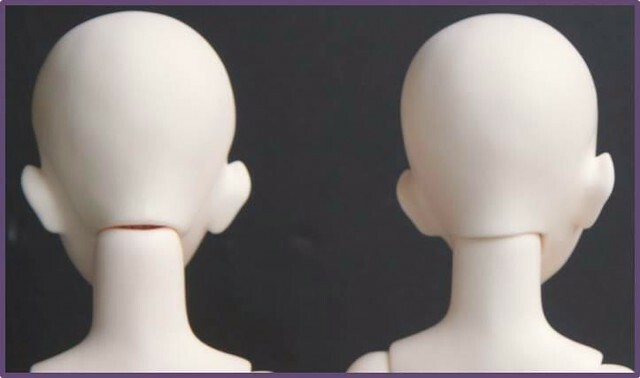 In the next photo, the unmodified head is on the left and the modified head is on the right. You can see how much larger and deeper the neck opening is now, and you can see the reinstalled magnets. You can still see some of the blue sharpie ink on one of the magnets (got to clean that off). And these pictures show how much the fit is improved. Once again, the unmodified doll is on the left and my modified doll is on the right. The next time you see these gals, they’ll have faces (and some hair and clothes). 04 Sep	This entry was published on September 4, 2013 at 9:42 pm. 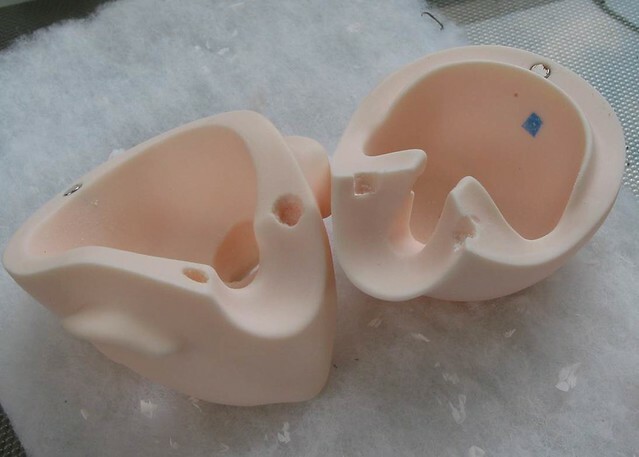 It’s filed under Modifications, Tutorial and tagged ABJD, Ball Jointed Doll, BJD, DIM, Doll In Mind, hybrid, Lalia, Love, modification, Resin, Robbin Atwell, Tutorial. Bookmark the permalink. Follow any comments here with the RSS feed for this post. wow you are amazing. i would have never been able to do something like that and prolly would have ended up selling the doll off… 😀 awesome job!! I would be afraid to ever attempt this. Luckily, I have a very talented & fearless best friend, YOU! Amazing work. This is a great tutorial. Thanks for the info, I feel much more confident about modifying resin having seen this. I’m still a bit of a coward. All of my modifications so far have been areas that are hidden (in a joint or hidden by clothes). But, that’s the perfect way to practice without fear!!! Thank you so much for making this tutorial! After a lot of contemplation I finally got a Dollits body for my mellowed Dream of Doll Bee-a head. All the research comparing resin colours paid off because the match is near-perfect! But the neck is way too large for the head. I’m still not quite ready to jump right into modding, but your tutorial is a huge help in explaining the process and giving me a bit more confidence about it. The comparison pictures throughout with the unmodded doll were really useful too. Thanks!